There are roads in Provence that can break your heart. This road near the town of St. Remy is one I have traveled almost every time I come to the region, and in fact it is so moving to me that I published two pictures made along its course in our book,”Provence: Lasting Impressions”. In those images the trees are leafed out in the fulness of summer, and again when fall burnished their leaves a rusty gold. Now, on a wintry day, with flawless sunlight etching every detail into my eye, the white bones of the trees are singing against the blue dome of the sky. I’m not stopping – as I have done before, to dance in the middle of the road and play in the oncoming traffic – but I’m driving straight through and letting the windshield be my frame while the miles of trees fill and empty it as I pass. I love this road and how I feel whenever I am on it. It always feels new to me, and yet it touches an ancient nerve where the definition of ‘road beauty’ lies in wait to be awakened once again. I remain susceptible to these quirks of mine and never fail to respond even if it seems as if I have had enough of them to last a lifetime. And I may have. But I believe in letting loose the arrows in my quiver whenever the impulse arises. That gesture, that Yes!, is my tipping of the hat to the spirits that have guided me to respond to the world for more than 50 years, and I never say no. 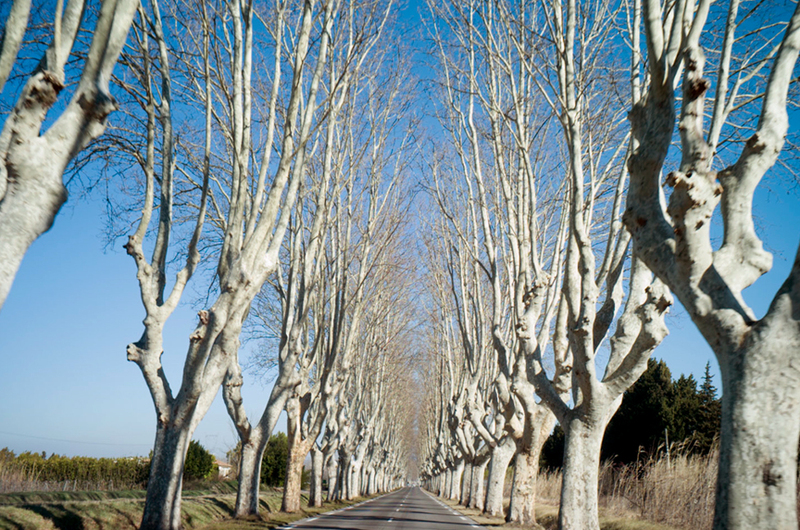 This entry was posted in Plane tree, Provence and tagged France, From The Car, Landscape, Provence, Road, Trees on February 20, 2015 by joelmeyerowitz2014. Cela m’évoque de vieux souvenir de vacances, quand je traversai la France en voiture avec mes parents dans des paysages similaires. Ces longues routes bordées d’arbres et de champs à perte de vue surplombées par un ciel monochrome, la fenetre entre-ouverte pour n’avoir qu’une legère brise sur le visage et des vieux tubes français qui innonde la voiture. Belle photo Joel.